I had not been back to Eye church for years. I had often passed through the town, often stopped here indeed, but the church was such a big project I had usually carried on to somewhere else. I finally tipped up here on the first Sunday in September 2018, a few minutes after High Mass had finished. The great church was full of incense, the bright summer light thrusting through it, claiming the interior for something greater and more numinous than mere congregational worship. 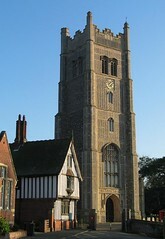 Eye is perhaps the most robustly independent of Suffolk's smaller towns. It isn't big at all, but it is far from anywhere else of any size in the county, if you ignore Norfolk's Diss looming on the horizon. The railways reached it, bringing with them proud 19th century municipal buildings. Until the 1830s, the town returned two members to parliament, and it still gave its name to the parliamentary constituency until the 1970s. There is a castle (or, at least, what looks like a castle), some decent pubs, a theatre, and one of Suffolk's grandest churches. The great flint-encrusted tower of St Peter and St Paul rises above a stunningly crafted interior. 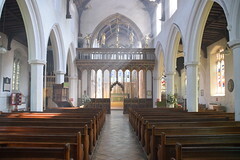 Here inside, we will find the nearest thing Suffolk has to a fulfilment of the ecclesiological aspirations of our great-grandparents' generation. From a tiny spark, a glint in the eye of John Keble at Oxford in the 1830s, the sacramental revival in the Church of England spread like wildfire over the course of the ensuing century. 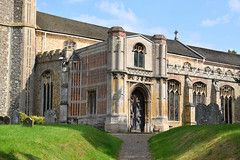 The Church set about rediscovering its Catholic roots, and the preaching houses of the Hanoverians were stripped bare and filled with all the best that the Gothic revival had to offer. 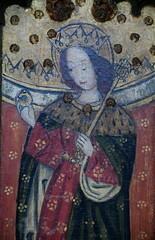 In many medieval churches, original artefacts were rediscovered and pressed back into service. Where this wasn't possible, the mass-production workshops of Birmingham and London could be called upon to provide what history could not. Ironically, the catalyst for all this had been some of those very reform acts which had deprived Eye of its 'rotten borough' status. Catholic emancipation in the 1820s had been followed by grants to a Catholic university in Ireland. Keble, along with Pusey, Newman, Froude and the others, saw that the Church of England was in danger of being sidelined as a protestant sect. The Oxford Movement, as it became known, published a series of tracts to try and educate the middle classes about their lost past. Their intention was that the Church would recover its catholicity, and its destiny as a national church, but the inevitable result was that some of the Movement, Newman among them, would leave the Church of England to become Catholics themselves. 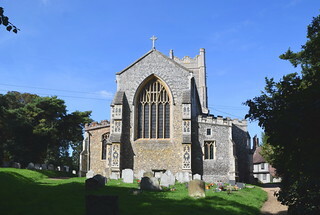 The medieval Church that they most admired was that of the early 14th century. This allowed them to see the later medieval period as a decline, an abuse-riddled downturn, from which the Church had to be rescued at the Reformation. However, as the Movement went on, there were many who asked if the Reformation had really been necessary at all. 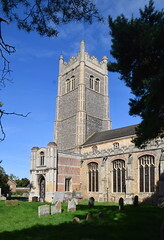 The grandeur of Suffolk's biggest churches on the eve of the Reformation was a direct result of the county being the late medieval industrial heartland of England. Here at Eye that wealth rebuilt the tower in the second half of the 15th century. 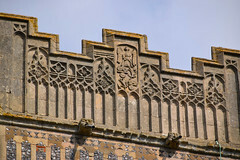 The same masons were working at Laxfield and on the near-identical tower at Redenhall, over the Norfolk border. 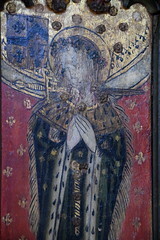 As at Redenhall, it was De la Pole money that rebuilt it, and the family arms are discernible still. 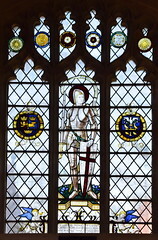 Most spectacularly, high up on the south side of the tower top stands St Michael the archangel, overseeing it all. Sam Mortlock points out that you can see the shape of the windows change from late-Decorated to Perpendicular over the course of the 40 years or so it took to build. You can see the last windows, the pure rationalism of the late Perpendicular period, right at the top in the bell-stage. Beneath are some more mystical Decorated windows, and below them the vast west window which bridges the gap between the two. As the tower was being completed, so the rest of the church was undergoing an opulent rebuild. You can see evidence of the extension at the east end of the south aisle, where a blocked door sits beside the new one into the chancel. As at Lavenham, the parishioners here were left in no doubt about the rise of secular power and its might. Soon, the De la Poles, the Springs, the De Veres and so on would outgrow the middle ages, and the aspirations of wealthy families such as these would give rise to the Reformation, the nation state, and ultimately capitalism itself. This was in the future. 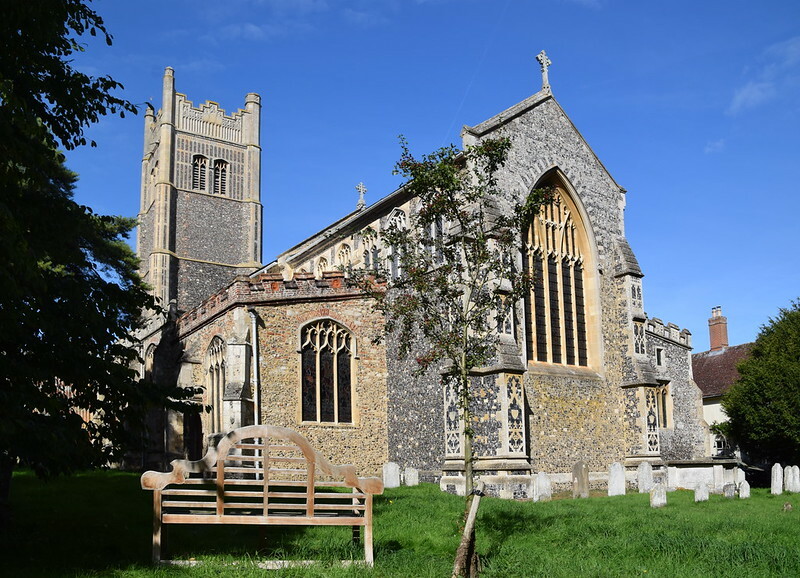 For now, the De la Poles invested in prayers as well as commerce, and although their south porch is a bit battered these days, it remains one of the loveliest in Suffolk, its brickwork echoing the gildhall on the other side of the church. You can only enter it from inside the church if you hope to see the dole table and fine 13th century doorway that survives of the earlier church, and you have to be there when it is open, for it now contains a shop. 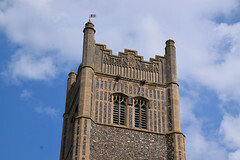 Externally then, this is one of the great East Anglian churches. Here we see the late medieval Church in all its glory. But in the 1530s, a collision of expediency and opportunity put an end to it all. Henry VIII took the Church out of Europe. His son Edward VI enforced its protestant credentials, and Edward's sister Elizabeth I settled the whole thing by imposing the Elizabethan Settlement, a suppression of the old ways, to bolster her grip on power. The past was subverted and lost, first as Anglicans, and then as Puritans, we overthrew the religion of our parents and grandparents, of the long English generations. We all but obliterated the old order, the ancient faith. Much was lost which was dear to us, and much was forgotten which we had believed to be true. This was what the Oxford Movement tried to recover, but in the context of a national established church, with spectacular results. By the end of the 19th century, the Anglo-catholic movement was in the ascendant. Most churches now saw Holy Communion as the main service rather than Morning Prayer. Most churches returned their focus to the altar rather than the pulpit. 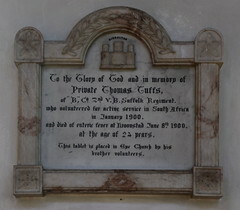 Perhaps the formality and splendour of the high church aesthetic chimed with the pomposity and rhetoric of British imperialism, for it is worth noting that the rise and fall of Anglo-Catholicism as a mainstream tradition coincided almost exactly with the growth and decline of the British Empire. 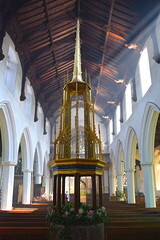 The movement reached its height in the early years of the 20th century, and probably the greatest exponent of Anglo-catholic fixtures and fittings was Ninian Comper. Comper, who will be familiar to many in Suffolk for his work at Lound and Kettlebaston, at Ipswich St Mary Elms and Ufford, all beacons of early 20th century Anglo-Catholic correctness. All disappearing now, alas. The ritualist tide has receded almost completely, and only the trappings and debris survive here and there, a reminder of what once was. 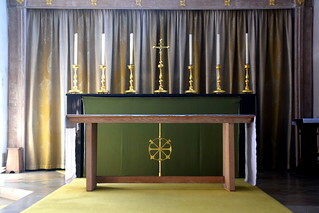 An age that hovers on the edge of a public memory, when the formal vision of the established Church was at the heart of British daily life, an age of candles and incense, of richly coloured vestments and four-part choirs. An age of anthems, and war memorials, and processions, and coronations, and a liturgy that brought you to your knees. But in some places some of this still survives. Here at Eye the tradition has not completely receded. You walk beneath the great tower with its wonderful fan-vaulting so uncharacteristic of Suffolk, and then into the open space of a large, civic church. As at Hadleigh, Halesworth, and other small Suffolk towns, the 19th century restoration here was pretty significant. However, into this created space have been placed furnishings of superb quality and design. The centre piece is Comper's magnificent rood loft, built on the remains of the medieval screen in the mid-1920s. 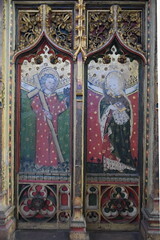 The screen below is perhaps not as good in its way as some of the county's other late-15th century screens, but in any case pales slightly beneath the loft, which is easily the best 20th century work of its kind in Suffolk. 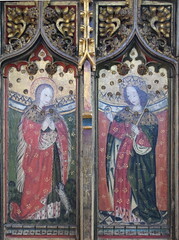 The figures on the dado screen must have been painted in about 1500, which is to say rather later than most East Anglian screens. Pevsner thought that they were all bad. It is true that they are doll-like, with nothing like the sophistication of those across the A140 at Yaxley, for example, but they have a certain naive charm. Perhaps they are symptomatic of the decay in English art towards the end of the medieval period. Curiously, the gessowork that forms a relief to the figures is really quite sophisticated. 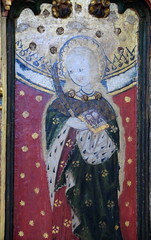 They are, from north to south: I: St Paul, II: St Helen, III: St Edmund, IV: St Ursula and her eleven thousand virgins, V: Henry VI, VI: St Dorothy, VII: St Barbara, VIII: St Agnes, IX: St Edward the Confessor, (the gap into the chancel is here), X: St John the Evangelist, XI: St Catherine, XII: St William of Norwich, XIII: St Lucy, XIV: St Thomas of Canterbury, and XV: St Agatha. 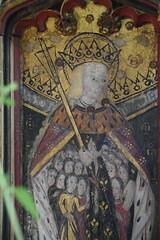 Many of these Saints had strong local cults in the late medieval period, and are familiar from other East Anglian screens. 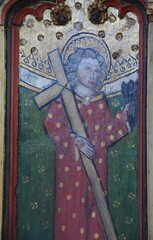 The less common St William of Norwich adds a little colour, standing as evidence of an anti-semitism that persisted well into the late middle ages, despite (or perhaps because of) the fact that the Jewish population had been expelled some two centuries previously. 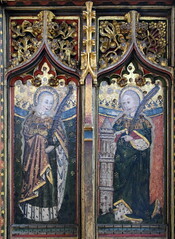 Two of the other images resonate strongly - the cults of Henry VI and St Thomas of Canterbury were particularly frowned upon by the 16th century reformers. 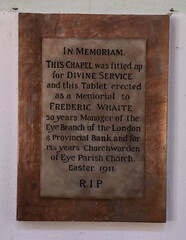 Up in the chancel, an entirely secular memorial recalls the Reverend Thomas Wythe, for fifty years Vicar of this Parish. he died in 1835, and the monument notes that he cordially believed, zealously preached, assiduously practiced. It is unlikely that the Reverend Wythe would recognise the inside of his church today. 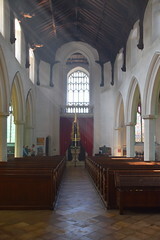 Much of what was foregrounded in this church by the considerable 1850s restoration was further adapted and enhanced by the higher church over the ensuing century. 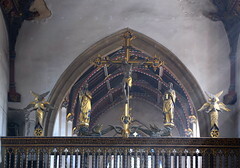 The most spectacular work is by Ninian Comper. 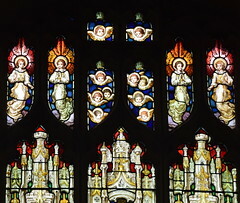 As well as the rood and rood loft already mentioned, he produced the great east window depicting the Risen Christ flanked by St John, St Peter, St Paul and St Polycarp in memory of John Polycarp Oakey, parish priest here who died in 1926. Oakey oversaw the Anglo-catholic revival here with the help of Maude Tacon of Brome Hall, who was patroness of the living and also, it seems, Oakey's lover. 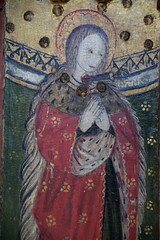 Comper was a close friend of the Tacon family, and even designed Maude Tacon's memorial in Eye Cemetery when she died. Comper's also is the towering font cover, and the window of St George in the north aisle in memory of George Gerald Warnes, a 'Black-and-Tan' auxiliary who was gunned down by the IRA in Grafton Street, Dublin during the so-called 'Troubles' that preceded the Irish Civil War of the 1920s. The process continues. 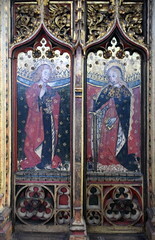 The elegant tomb recess in the north aisle, for example, is host to Lough Pendred's 1960s Madonna and child. 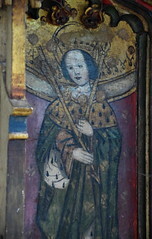 Pendred carved the same subject in a different composition for the lady chapel in the south aisle. To be honest, this kind of light wood romantic abstraction is very much of its decade, but there is a poignancy to its presence here in one of the surviving outposts of modern Anglo-Catholicism. 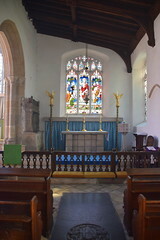 Eye is one of the few Suffolk churches that still 'sports the big six'; that is to say, has six tall candles on the high altar. 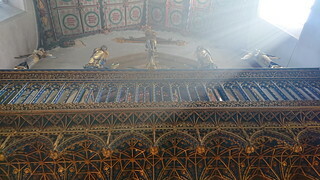 Comper decorated the chancel roof, which glows magnificently in the morning light through the east window. 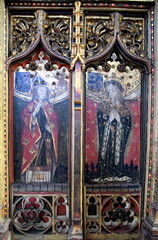 Tucked away in two corners are two post-Reformation tombs to Nicholas Cutler and William Honyng, the first in the north aisle (it was originally in the sanctuary, according to Mortlock) and the second in the south aisle chapel. They are curious, because they appear to be almost identical, although whether this is a tribute to early-modern vanity or mass-production I couldn't say. This is a church in which to wander. It is full of interest, little details and quiet corners. A bit like Eye itself. Beside the church, the large, half-timbered building to the north is the former guildhall. For a long time this was a wonderful second hand bookshop, but that is now closed. On the corner post are the restored angels of the Annunciation - one only has been left unrestored. Perhaps it can stand as the symbol for this splendidly reinvented church.